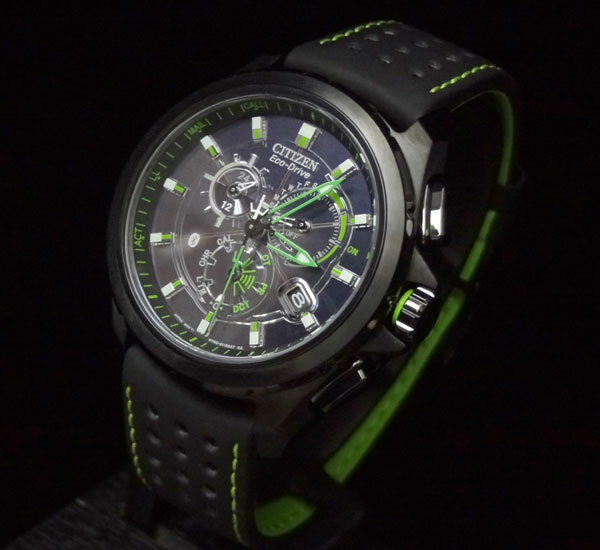 For all the iPhone fans, Citizen has just released a new a new timepiece that is compatible for iPhone 4S and 5. 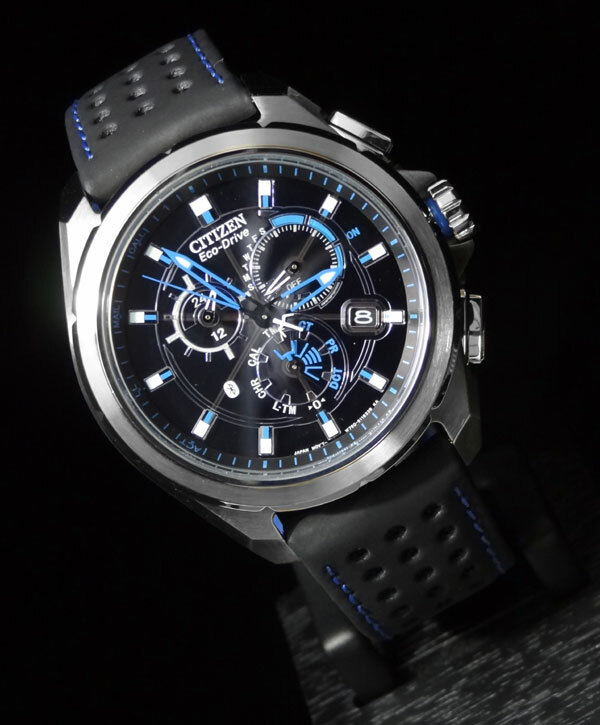 The Citizen Eco-Drive Proximity Bluetooth watch has finally delivered and is now for sale. Before I get into all the functions that Bluetooth will actually do, I wanted to share what the watch does without a Bluetooth connection. A perpetual calendar, chronograph and secondary timezone are some of the functions you have, just for the timepiece itself. On top of that, there is also a 24 hour (AM/PM) indicator, and power reserve display. 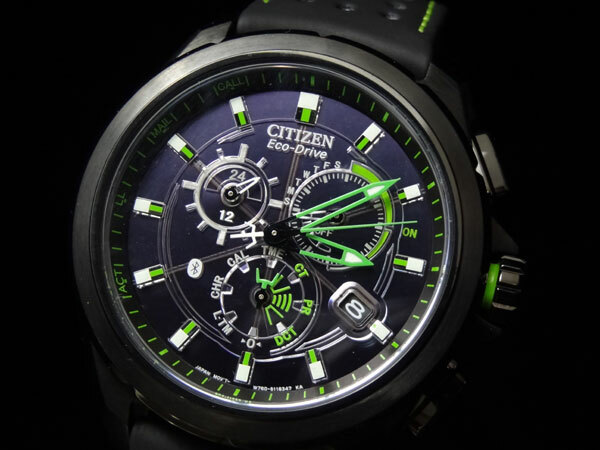 The Proximity is solar powered using Eco-Drive technology. This piece can go 8 months in the dark using Bluetooth, or 17 months without. The Bluetooth utilized is the lowest energy consuming Bluetooth 4.0. Proximity connects to iPhone through Bluetooth and once the free app for your phone is downloaded, you can do the initial pair with the watch. You can adjust to pairing mode (PR) by rotating the crown while it is pulled out to the 1st position. After you have done the 1st initial pair, you can reconnect by adjusting the mode to connect (CT) or pushing the top button for about 3 seconds. Both the watch and phone need to be used for the initial pair and reconnection. If the Bluetooth is left on, the watch will automatically disconnect after 6 hours which helps conserve energy. When connected, Proximity will alert you of incoming calls, emails (which can do up to 5 email accounts), calendar notifications, and if you lose your Bluetooth connection. This alert is a subtle vibration and the second hand pointing to the appropriate indicator. 11 o’clock-will be for calls, 10 o’clock for email or calendar, and 9 o’clock for lost connection. The second hand will continue pointing at the indicator unless you press the upper right button for a 2-3 seconds, and then will jump back to perfect time. This is to let the watch know you saw the call, email, etc. There is a 10 meter (33ft) sync range, and if the phone and watch get that far apart, you will receive notification. If you’re quick enough to get back within range, it will automatically reconnect and this also helps prevent the loss of your phone. One of my favorite features is the phone finder. Should you lose your iPhone, you can push and hold both buttons for about 2-3 seconds. Whether or not your phone is on silent, your phone will ring at full volume through the app. You do not have to be connected for this feature, you just have to establish the initial pair. If you are concerned about timekeeping, the watches time, date and accuracy are all adjusted by the phone. This is great for traveling, as it will automatically adjust timezones (as long as your phone is setup that way) as soon as it reconnects. The iPhone keeps atomic time, and your Proximity will as well. You can manually calibrate the accuracy on the watch to the phone by pushing the lower right button for about 3 seconds. If you keep the Bluetooth off and do not update, the accuracy rating is -/+ 15 seconds a month. 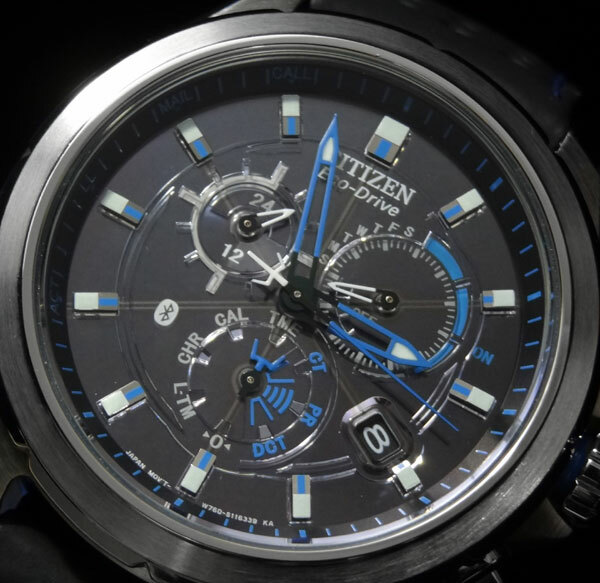 It is certainly a great looking watch for the money not even including the Bluetooth function. 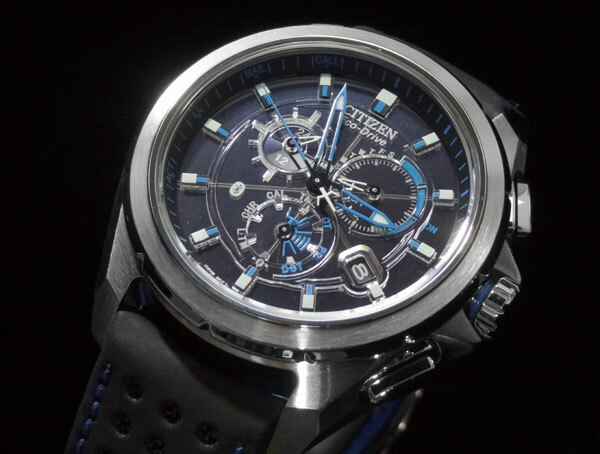 There are currently 2 variations of the watch, which are 46mm, have anti-reflective mineral crystal, 100m water resistance and fabric straps with polyurethane coating and contrast stitching. 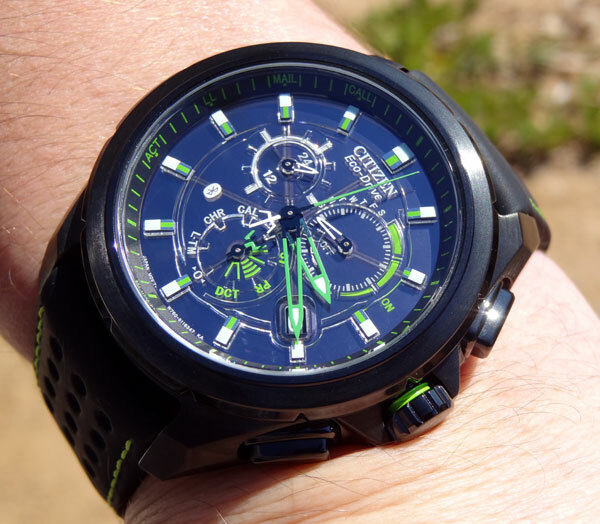 The stainless steel with blue (AT7030-05E) and black IP with green (AT-7035-01E) both retail for $495 but can be purchased directly through our site for $371.25 HERE. This price is also valid over the phone or in store. For this impressive timepiece, we will be hosting an event tonight from 3-7pm here at AZ Fine Time in our Scottsdale retail store. 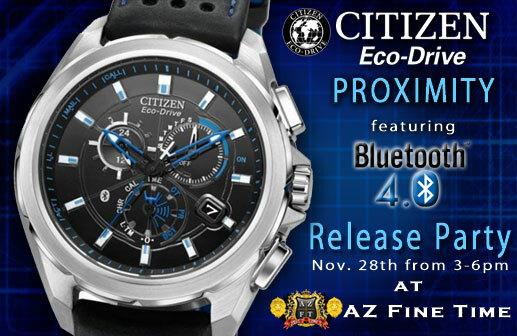 During the event, we will have Citizen USA’s Director of After Sales Service (who also is their head technology expert) in store doing a unique presentation on the new Proximity Bluetooth watch and how it works. After each presentation, there was a Q&A session for inquiring customers. We’ll also had free drinks, food and cigars for everyone in attendance. With the purchases of any Citizen product, we had T-shirts, hats and other promotional items. All orders placed online through this weekend will also get a free Citizen T-Shirt. 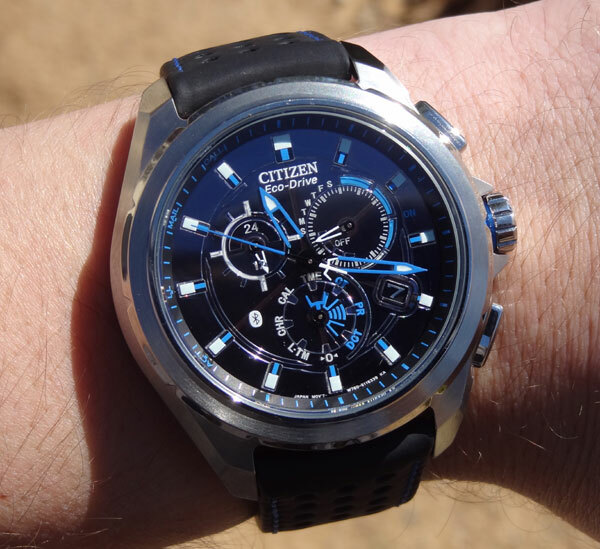 Citizen Watch Co. has had a lot of buzz about their new Proximity Bluetooth syncing watch. You can read more about it HERE. 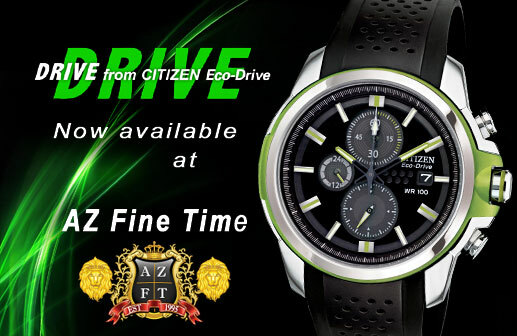 For those who have not seen the latest introduction from Citizen, the new Drive by Citizen Eco-Drive was just released and delivered to AZ Fine Time today. All the pieces in the Drive collection retail for $295 or LESS! These cool new designs feature a new proprietary Chroma finish (which allows for the bold color on the cases to be extremely durable and scratch resistant). All the watches will be in either 40.2mm, 42mm, or 44.5mm. 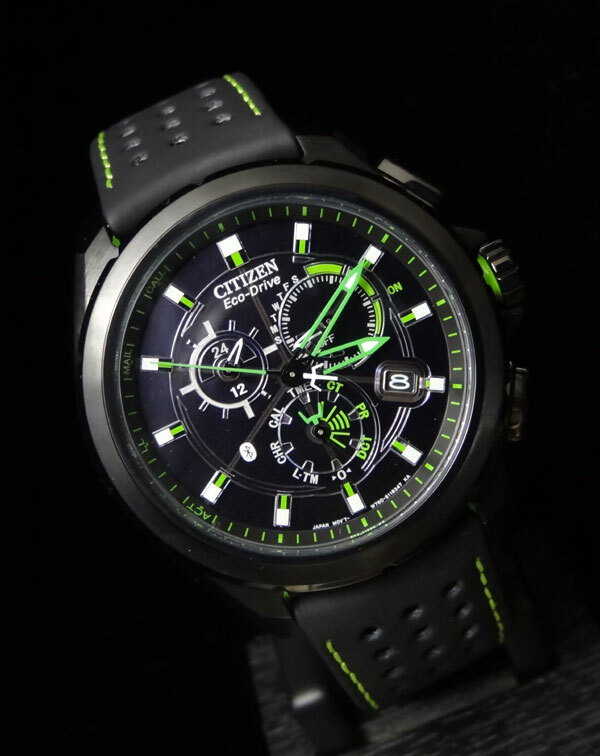 A very cool new release from Citizen that is in a tremendous price point! These models will not be sold directly through our website, but we should have images up on the site to browse through by next week. Be on the look out for a post next week on our 1st impressions of the Proximity.